A bit of a serious post today - this month Knightcote Model Boat Club winter meeting was on the subject of first aid for modellers. Looking at our membership profile, the committee felt information for the members on what to do if someone keels over would be a good idea. Like most model clubs, when you look around you see a lot of middle aged and later men who haven't spent a lot of time in the gym. The chances of needing this sort of knowledge appear high. Fortunately or membership is broad (literally at well as metaphorically) and includes someone who has given lifesaving lessons in the past and more usefully, a motorcycle based paramedic. First up we were treated to a run through of the sort of kit you can carry on motorbike panniers for saving people. It's an amazing selection and well laid out - as he said, "When I get there I'm on my own, there isn't anyone to hand me stuff !" We then had a quick demo of basic CPR on the larger of the two Resusci Anne's on the floor. Apparently it's more important to get the heart compressions in then giving the "kiss of life" as we retain quite a lot of oxygen (16%) in our bloodstream and so getting this moved around matters more than pumping a bit more (4% apparently) in by inflating lungs. To be honest the whole process is quite violent but as was pointed out, when you are doing this the patient is in a pretty bad way. People who's heart has stopped die more often than those with broken ribs, so get on with it using as much force as necessary. And it does take a lot of force. It's hard work too - the pace apparently matches the song "Nellie the Elephant" (Original version, not the one by the Toy Dolls) with 30 compressions followed by two breaths into the patient. Several of us had a go so we could make our beginners mistakes on the doll. Learn how to use your mobile. When you ring 999, the operator will prompt you to do things to help the patient. If you can put the phone on loudspeaker, this will be very helpful. Asking "How do I use a Motophona 634623689" is not. Look it up in the instruction book now. Know were the nearest non-mobile is in case yours is broken or has no signal. Know the postcode and proper address of the club - ours will soon be written on the first aid box in large letters. This helps ambulances find you quickly. You'd be surprised just how many people don't know these details, especially when flustered. Know what is in the first aid box. We have 2 tin foil blankets in our but most of us didn't realise this. If someone fell in the water, wrapping them in a blanket could stop hypothermia. 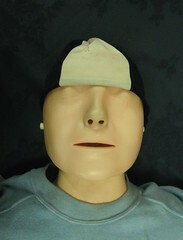 Simple stuff but ideas that could save a life more readily than the actual first aid part. Let's hope we never need it. All the O14 sleepers have holes moulded in them for the spikes intended to hold the rail. 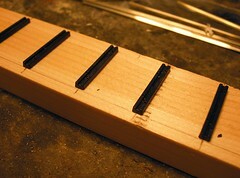 The theory is that you place the rail between the holes and push a spike down each side so it grips the base securely. This is how the prototype does it in many parts of the world - notably in early American railroads - as well as many narrow gauge lines. Theory is fine but give it to someone as cack-handed as me and bad things can happen. First up, the head of the rail is 0.9mm wide and the base 1.7mm. By my calculations that leaves 0.6mm of visible base if you look from the top of the rail. Therefore the horizontal gripping bit of the spike needs to be 0.5mm wide. This assumes vertical spiking which the moulded holes encourage. The supplied spikes have to be trimmed back according to the instructions so I diligently snipped them back a bit (before you say it, Peco spikes are no better as the top is the same and the spike a lot longer) although without any great precision. I'm not using my best snips for this and only the big 'uns would go through the metal anyway. Narrow gauge track might be a bit wobbly on the prototype but if this carries on, the gauge will be all over the place. Never mind, this is a learning expereince and I have another idea. First up - fix the sleepers to the baseboard. In the instructions, Sundeala is recommended as it will accept pushing in the spikes that hold the rail down easily and without recourse to a hammer. I'm not building a layout, just a test track, so a piece of pine was chopped to length. It's a little harder than Sundeala but more likely to remain flat over time. Anyway, I didn't have anything else to hand. The sleepers are very nice mouldings of Hudson pattern cast iron prototypes. 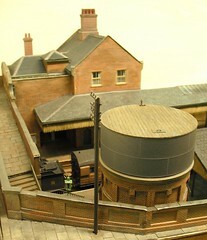 KB Scale specialise in industrial railways and those lines were often laid and re-laid as the construction project or mine workings required. Temporary railway lines are something we rarely see nowadays (the channel tunnel was the last one I know of, but please feel free to correct me) and the cast iron sleeper was more robust than its wooden counterpart and therefore better suited to this use and abuse. Yet again, I ignored the instructions when they suggested using plastic solvent to fix the sleepers to the "board". I prefer double sided sticky tape for this job. OK, the track isn't going to be lifted in the same way as you do when building PCB track - the spikes mean once laid it will be firmly nailed to the baseboard ! Sleeper spacing is suggested in the instructions. The kit allows two track panels to be made up and ensures you get something prototypical. I held the plan against my bit of wood and marked the centres in pencil then put the tape down and finally the sleepers. If the spacing is a bit off, well I don't suppose the real thing was perfect. I buy projects on whims sometimes. 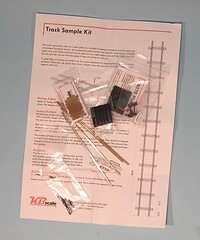 That's why after reading a review in Narrow Gauge and Industrial Magazine, I bought a test kit for some O14 track and a wagon from KB Scale. For a tenner, I couldn't go far wrong and it certainly looked interesting. The kit arrives in a small clear plastic box and contains rail, plastic sleepers, spikes, fishplates, a wagon kit, instructions, track gauge and finally an "I love O14" badge ! 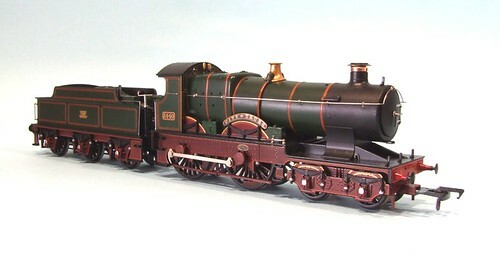 That's pretty good value for money in my opinion and just the sort of thing to encourage modellers to try a new scale. Once you have unpacked it, you have no choice but to start building as you'll never work out how to get this quart back into the pint pot. Actually this project isn't entirely pointless - my favourite railway is the Groudle Glen on the Isle of Man. 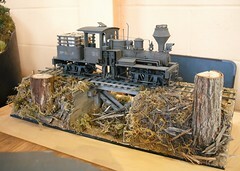 As a 2ft gauge line, it could be very nicely modelled in 7mm scale using O14 equipment. That's if I could cram the motors into the tiny locos. 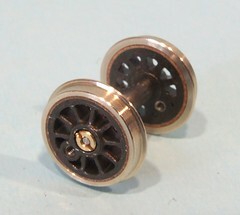 And work out where to get the midget wheels from - the pony wheels would only be 5.25mm in diameter ! Avast me hearties ! What do we have 'ere ? 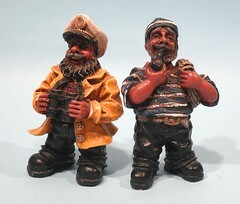 A fine pair of salty sea dogs no less. Mine, along with 4 of their comrades for a measly 3 quid at a local car boot sale. I recognise these little sailors. They are normally to be found in tourist tat shops at the seaside and while I've looked, they were never press ganged into my modelling supplies. For the money though, they were worth a look. First the vital statistics. Each figure is around 10.5cm tall which according to my maths makes them around 1:14 scale. Not a recognised size but people come in all sizes so we can allow a bit of flexibility. They weigh 85g and are made of resin. Purists might say that they are a bit cartoony and I couldn't disagree. In their defence, waterproof garments are quite bulky and some sailors can be portly so the proportions aren't much worse than many model figures I've seen. One thing they would benefit from is a coat of paint. Those complexions are more than a little ruddy and the shadow work on the coats is a bit extreme. None of this will defeat a can of spray primer and some Humbrol though. At the moment I'm tangling with a Comet Models Coach kit for a, well, coach. Now I've not built many coaches in the past and those I have been plastic apart from a couple of narrow gauge specimens. This means the whole thing is a bit of a voyage of discovery for me. Since I have aspirations to write up the build for a magazine, that's not a great thing. Most of the work is simple enough for the veteran campaigner in the etched kit world but there are new ideas to assimilate. Luckily for me, mooching around on the website, I find that they allow you to download a useful instruction booklet giving general advice applicable to the entire range. It's a very good and interesting read. Even if you don't fancy building a coach, have a look anyway. I can't praise this action enough. This booklet has taken time and effort to produce yet if you can live with an electronic copy, you get it for free. On the stand I suspect the £1 fee is just to limit the distribution to people who are really interested rather than those out to collect as much free paper as possible. It's not the only guide either - the downloads section of the site contains a wealth of material that I will be working my way through. 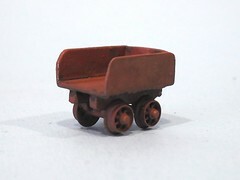 A nice quick project - a little slate wagon from the RT Models kit in 4mm scale. The "kit" is simple enough. A whitemetal body and chassis plus couple of n gauge axles. These are glue on to the bottom of the casting with superglue and the job is done. In an effort to make things a bit proper, I files grooves for the axles but managed to get these a bit less than level which meant a bit of fiddling to get the model to sit properly. If you wanted a working model I suspect some brass tube around the axles stuck in place would do the job. I think this is meant as a scenic accessory though. The real thing would have been worked by a man pushing it along and if you can figure out how to make one of these in 4mm, then you don't need my advice on rotating axles ! Paint is rust washed over with track colour. I will play around with this a bit more to see if I can get a bit more wear and tear to show through. Eventually this will be "dumped" behind a shed on the box layout I think. With some nice long grass around it I think it will look the business. Lovely place, Princess Risborough. A very pretty town with little in the way of chain shops apart from the inevitable Tesco on the outskirts. Red kites populate the skies. There is an excellent garden railway shop near the station which is a ten minute walk from the high street. The train trip in was lovely, the bright blue skies threw the denuded winter trees into sharp relief against the white fields. Every time someone announces that the country is disappearing under concrete, I wonder if they have even left the motorway and travelled in a more civilised manner. I could have spent a similar amount of money trundling down the M40 but this was a whole lot more pleasant. I know people get sniffy about small events but I like them. It doesn't really matter how large a show, you can always pick something up. For example, behind Chertonwell there was a fantastic loco maintenance bench complete with tiny test track and most importantly, a lip around the edge to stop tiny parts falling off. After chatting to Stuart about it, he has blogged fuller details. Looking in the fiddle yards, I definitely covet the contents of those in Grey's Steelworks. Lots of industrial locos from many different sources. 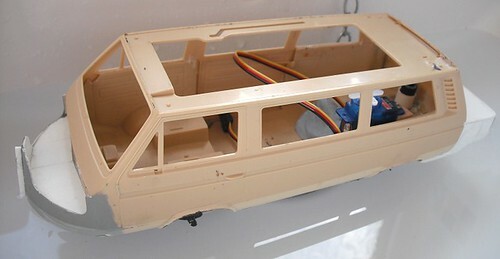 Several were conversions of DJH 02 diesels adding a front veranda that the industrial version of this prototype enjoyed. Others were bashed from Hornby 06 diesels. The traditional jack rabbit operating abilities of the chassis were tamed by plenty of lead to produce a reasonable result. The builder admits he'd still like to rebuild them at some point though to improve things even more. Most unusual was a Bo-Bo from an A1 models etched kit. This is every inch an industrial loco and a real brute to boot. Just the sort of thing you would have at a large steelworks. Prize for "layout I'd like to build" goes to Viller street. This is a green diesel fueling point. Nothing special there except that it's viewed from end on - you look along the model. I liked the atmosphere and the detail as well as the unusual aspect. OK, so it would be deadly dull to operate but as a small model to show off a collection of post-steam rolling stock, it has a lot of potential. The move from a traditional MPD, where locos don't move that much, to a fueling point where they drop in and out for servicing, works well. With some intensive operation you could rotate quite a number of models through the scene in an hour. The main highlight for me though, is the demo every year of On30 rolling stock. Last year I loved the railtruck, now it's been joined by several other locos. All are displayed on small diorama pieces which show them off in context and obviously also provide some useful practise in scenery construction. 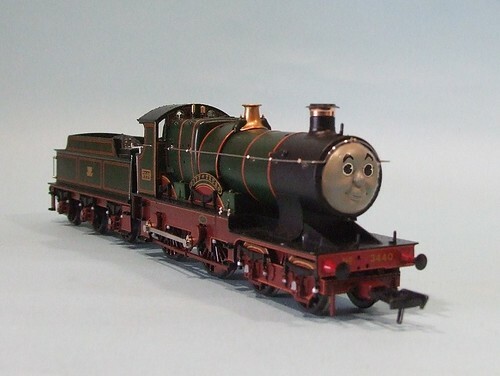 I aspire to this quality of modelling once I get stuck in to the US narrow gauge scene properly. The builder (who was at lunch when I was ogling) had also made a shop front out of blue foam - the sort you buy from DIY stores - carving the brickwork into the surface. The results looked good with a nice level of deterioration, the sort you find in semi-derelict parts of "the wrong side of town". Again, a nice little show. Worth the visit. And excellent cake. What more could you want ? Etched brass kits arrive flat but pretty quickly they need a bit of folding. Bending along half etched lines isn't difficult but it's wise to support the bend. Traditionally you'd use a pair of bending bars but they are more suited to serious metal bashing than effete etched kits. I prefer a nice square ended pair of pliers for most jobs. 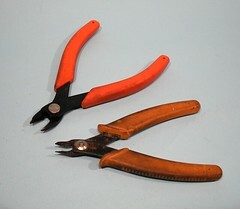 The yellow handled pair shown are brilliant as they have relatively long jaws with no wire cutters or serrated faces. You can get right into a corner and grip, then push the metal round with your finger or by pushing it against a bit of wood. And they only cost me a pound. Much more expensive is the "hold'n'fold" behind. 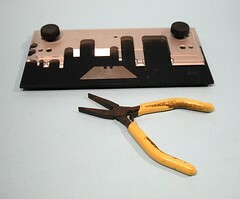 Parts can be gripped tightly and then bent up by sliding the Stanley blade under the ungripped side of the fold. 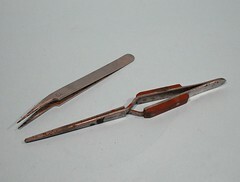 While not essential, this is a very handy tool for the keen etched kit builder. Long folds, such as solebars channels, can be supported along their length thus avoiding a series of kinks of bends which result in inadequate support. 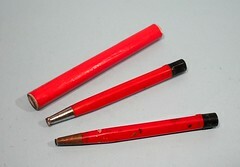 The fiberglass pencil was originally a draughtsman's tool. Rather than rub out marks with an eraser, they would use the fibreglass to remove them. I suspect this was mainly for working on film rather than paper but am happy to be corrected. In model railway terms they appeared as a tool for cleaning locomotive wheels - the model is turned upside down and power applied to the wheels. When they are rotating the fibre pen is used to polish them up. The beauty is that the fibreglass is softer than the wheel rim so the later isn't damaged as it can be when cleaned with a stiff brass brush as supplier by Triang or similar. Beyond this, it's a very useful tool for cleaning excess solder from brass and nickel. You can also polish numbers and other transfers from ready to run models. This leaves a shiny patch but that's covered by replacement numbers or weathering. I like to have a clean and dirty pen. 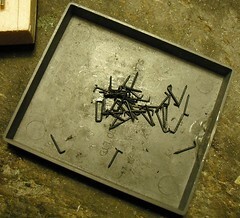 The brass tipped ones is "clean" and used for wheel cleaning mainly. The other get used in kit building and soaks up grease and flux which I don't want on my wheels thank you ! The fat bundle is the same thing but less sophisticated. Bought from a model engineering show for a couple of quid, as opposed to the model railway one where it would be 6 or 8, it's a great solder scrubber. A blob can be spread out with plenty of flux over the surface, including rivet detail, and then polished away so no-one ever notices. Safety note: The fibres do break off. If one get stuck in your finger, put some sticky tape over it and then remove. The glue usually grips the fibre and yanks it out in one piece and it's a lot easier than doing the same job with tweezers. There are two types of wire cutters in my collection. Good ones and knackered ones. The later (bottom in this photo in case you hadn't guessed) tend to be from general tool sellers and often are designed for electrical work. Fixing things to circuit boards required the component legs to be snipped off, ideally flush to the board. These small cutters aren't awfully expensive and yet have loads of uses on a model. Cutting brake cross wire under a wagon is the first thing that springs to mind but handrails and even separating parts from plastic sprues are others. Eventually the edges look crinkle cut and you struggle to find a sharp section to do some snipping. At this point a sensible person would throw them away but I find they will soldier on for a wile longer. The good set came from a shop in Birmingham's Jewelery Quarter and cost in the region of 20 quid. Even then I looked at the even better version at half as much again and wondered if they wouldn't be a wise investment. Wire cut with these is really flush to a surface and properly square ended. That saves a lot of filing and tidying up. The speed and flourish you can work at makes them worth the money. Mind you they don't get used when the cheaper/older versions will do. When the item I need to grab is too small for the pliers, it's time to reach for some tweezers. I suppose most modellers have several pairs of these kicking around - every cheap toolkit seems to come with a straight pair. It's logical that if you are doing fine work then you need tweezers to hold all those tiny pieces. Sadly the basic straight, rounded ended versions aren't the best in the world. Making them out of a relatively soft alloy doesn't help much either. 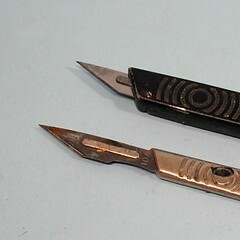 The sprung versions are a soldering tool. Parts can be gripped and held together while heat is applied. On the other hand you can hold one part against another and apply the iron. The metal doesn't seem to act as a heat sink in any tangible way unlike a pair of pliers which can cool a joint faster than an iron can warm it. You'll notice a bit of paint on the metal - that's because the tweezers make handy ways to grasp anything being brush painted. For example, a set of wagon wheels can be held by the axle so the wheels can be blackened yet your fingers stay clean. Ever since I received my first pair, a small set of pin nosed pliers has been like an extension to my arm when model making. When they vanished from the back of the car, along with the rest of my toolbox, they were one of the first items to be replaced. The current ones are at least 15 years old and still going strong. Ideal for gripping items being worked on and thus keeping delicate fingers out of harms way, mine never go in the box being a permanent resident on the workbench. 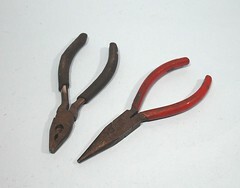 Obviously the wire cutters become useless very quickly for snipping wire but they can still excert useful pressure on tubes and anything needing crimping such as electrical connectors. The ends are still pretty good and meet up with only the tiniest of gaps. Small pliers are one of those tools it is worth paying reasonable money for as the cheap versions tend to break under pressure just when you don't want them too ! The pointed noses also get you deep into the bowels of a model to grasp screws needing adjusting or breaking off plastic clips that you wish to remove. 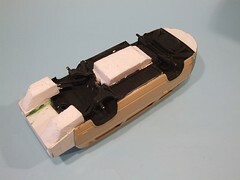 I've pulled the insides of RTR boats apart through deck hatches when planing to replace the gubbins with good stuff. The square ended pair give a better grip on some materials and I always feel they are less delicate than the pointed end ones. Oddly, I can remember where I bought this tool from, the hardware shop in Lochgiplhead. I was on holiday and had taken a small project to while away the odd hour in the rain but had forgotten the pliers. As I said, you can't live without them. I'm a bit light on actual model making activity to write about this week, so let's have a quick tour around the workbench to see what tools are lying around. First up, that most basic of modelling requirements, a good knife. My preference is for a Swann-Morton Scalpel. I've tried snap-off blade knives, X-acto things and always return to my scalpel. At the top is a the retractable blade version which is nice an chunky to hold and offers goo blade protection when not in use. The knife live on the bench and so this is important as it's likely to bounce off other metal tools. There's the added advantage of reducing the opportunity for me to cut myself too ! One point to watch - the holder does wear out eventually. 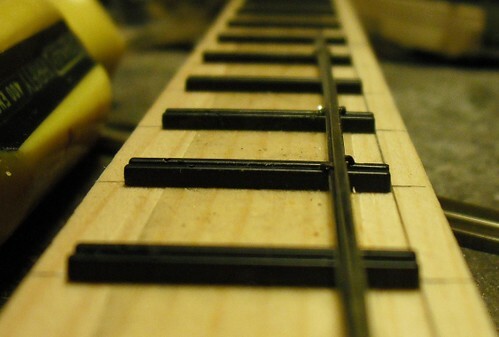 A groove opens above the blade and one day you'll find the point digging in to the top when you try and slide it out. For a while you just don't retract the blade fully but eventually give in and replace the handle. Below this is a standard Number 3 handle. This has to live point down in a block of balsa fixed to the bench between uses. My blade of choice is the 10A. The fresh blade is fitted to the retractable first and when it loses its edge, gets transferred to the standard version. Thus, the best work is carried out with the best handle and less jobs by the simpler one. Those lesser jobs include prising objects apart and working filler, stuff that doesn't needs a sharp edge but is better done with a knife. I've been reading your articles on your Beyer Peacock build - very useful thanks, and I noted with interest that you used Gibson wheels. Any reason behind that, personal preference or were they supplied in your kit? Mine came with Romfords and I've got a slight issue in that once they are fitted and the screw tightened to the axle they bind against the axle bearings. This is my debut with Romford wheels so I'm not sure if this usual with them. I'd quite like to rule out bad chassis building (but you never do know do you?!) as the spacers were inserted with the tabs fully home and its been built square. Next stop is to check the bearings are secured fully home (I suspect they are as I've got a slight OCD over leaving burrs). Then get the rulers out to check back-to-back readings. If all else fails then the only option I can see is to file the width of the outside of the bearing down slightly. The Gibson wheels were forced on me at the time due to a problem with the supply of Romfords at the time. This has now been resolved and in future I'll be using Romfords. They are much easier to fit as they can be removed and replaced as often as required. That said, there is nothing wrong with Gibsons, it's a personal preference. The bearing problem has a simple solution - file the faces of the bearing until the wheels fit. I've done this until the "brim" bit of the top hat is little more than a smear of brass on the chassis side. I suspect that this is a deliberate move on behalf of the chassis maker as it allows the builder to have as little sideplay as he or she wishes. 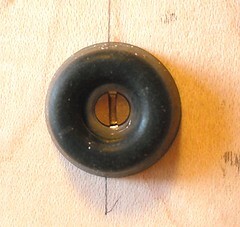 Other makers require you to pack out the wheels with washers to achieve the same result. One of the beauties of the Romford wheel is that it is self gauging - once the retaining screw is fully done up, no further work is required. In fact no further work is possible unless you want to re-manufacturer the axle and if you do, you need more help than I can provide. Tie-in books for TV programmes are usually rubbish. Often nothing more than a collection of stills from the series, you read it and quickly realise that the presenter had very little involvement in the words. There aren't many of these either as the book is aimed at telly watchers who unlike the sort of people who read this blog, aren't very good at that sort of thing. 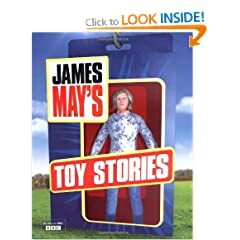 Despite this, I bought the Toy Stories book. OK, it was a present for my Mum along with the DVD because I wanted to read it and she liked the series as much as I did. What a shock - the book is better than the series ! You see, for the telly there can't be very much actual history or facts. That gets in the way of endless shots of crowds building Lego bricks or plasticine flower followed by some nice visuals of the finished product. For example the Airfix programme we spent most of the time with a group of kids having a go at building plastic kits for the first time. In the book they get less than a page. For the real enthusiast, there are appendixes with list of all the Hornby and Airfix products year by year, colours of Lego bricks, Meccano parts and 101 uses for plasticine. On top of the main chapters this makes for a hefty tomb of 272 pages. What I don't understand is how the BBC allowed this out. Even the text is funny and as far as I can tell, actually written by Mr May - although I see Ian Harrison credited as co-author. The styles and humour certainly fits his TV persona (please don't write in and say he is vile in real life, I don't wish to know) even the slight Jane Asher obsession. Oddly, the programme in the series that did least for me is replaced by my favourite chapter - plasticine modelling. The railway stuff I ought to love is interesting but left me a little cold, maybe I have been too close to it in the past. More likely I found the labyrinthine history of who owned who and took over others a little dull. The same thing goes for Meccano where there is a heck of a lot of depth that might loose some readers to dim to skim over it. After all, you either need to know the changes of colour of the parts over the years or you don't. I don't. Yet. Even Lego gets a decent write up. I might be picky and suggest that the history of the Minifig (little Lego people to the uninitiated) ignores the very early models with no expression and arms firmly moulded into their sides, but I couldn't disagree that with the suggestion that at one point the company had too many special bricks in the range. What didn't occur to me was that this problem was an issue with manufacture as the change over time between moulds takes a long time and the larger then number of "specials", the more changeovers you need. Anyway, I haven't enjoyed a book this much for ages, go out and treat yourself, you won't regret it. Desperation has set in. The Dampervan doesn't float and if the project can succeed that's precisely what it must do. I pondered adding some air-tight boxes to the underside to raise it up in the water, and then realised that some more polystyrene would work just as well and be a whole lot quicker to apply. Anyway, if it worked I could do a proper job later. A slab under the middle of the van plus a couple of blocks at the back end were stuck in place with suitable solvent-free glue. Once dry, the van was launched again. This time the waterline was very nearly there. OK, so the back is still a bit saggy but the front could be weighed down a touch with the mechanical bits. On some real water it might even be acceptable. But at what cost ? To get the model this high on the water I've had to stick great chunks of polystyrene underneath it. To make a practical model, even bigger lumps are really required. On dry land it no longer looks like the prototype damper. The compromises and disfigurement to get this far are huge. Too big for me I think. The problem is fundamental. I had assumed that because plastic floats, a plastic camper van would float. In reality, the kit is just too heavy to be seaworthy. That's not the manufacturers fault, they didn't intend to make a boat after all. If I want to build a working model of this vehicle, it will take far more work than the "quickie" project I'd originally intended this model to be. Therefore I need to move on and do something else. Unless some fancies taking this on (and if you do, drop me a line) I'll pack the model up and one day it will re-appear as a static item. The modifications so far look OK so this should work out but it won't be nearly as much fun. A bit earlier than normal, the March Hornby magazine arrives through the letter box and inside is the first piece of track destined for the Layout in a Box - a point made from an SMP kit. Also in the mag is a revamped "Staff Projects" section with a bit less Bay Street and a bit more me and Evan Green-Hughes to provide variety. 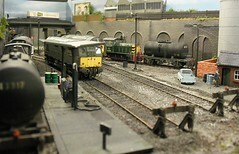 Best of all though, is the feature on Clarendon, our club P4 layout. This recently appeared in MRJ and looked terrible. The photos appeared to have been printed using an inkjet with one of the colour running out. Despite this they'd been sitting on the shelf for at least 2 years until pressure by the owner got them in print. The current ones have been turned around in months and look magnificent. The MRJ delay was particularly galling. While I am a member of the club who built the model, I'm not involved in any way with it's construction. 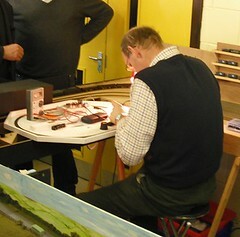 Despite this I think this is one of the best model railways anywhere. Certainly I bet it's in the ten best in the UK. Yet the finescale bible didn't seem to be interested. Me and Mr Accuracy have never been exactly been the best of friends. Despite my best efforts, no matter what I do, jobs always seem to require a little bit of bodging. Over the years I've evolved all sort of tricks to get around this problem - cutting parts oversize and trimming back to an edge being a popular example. At school anyone who taught me lessons involving construction would despair. I could measure all I liked and yet when the hole was drilled or the bit of metal cut, something would have gone wrong. Once I had to mount a couple of switches made from keyboard space bars on a PCB. When I came to fit them in place I discovered that the copper pads I had laid out were in such a position that the space bars overlapped. Not by much but enough to be embarrassing. I of course fixed this by shortening one and making a cut-out in the other then tried to excuse it by saying I wanted to make sure they both operated at once - no one was fooled. So it's no great surprise that the toolbox I'm building doesn't quite work. The door on the front matches the main box. Nearly. One of the hinges is a bit too high and I know if I try and fix it, this will go wrong. 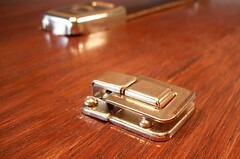 Instead I have to live with the latches needing a little tug to line them up. Not much of a problem, but annoying. Araldite joins between plastic and stainles steel tube can be broken with a bit of wiggling one you've chipped the glue away. I found this out because I've decided to go back to first principles with the Damper van. It's obvious my plans just to stick a couple of extensions on a plastic kit and then fill the body with motor and radio gear isn't going to work. I need some science. So, the motor and rudder have been removed. The prop shaft hole has been bunged up with Blu-tack (a small Dutch boy with a finger not being available) and the model launched again. Result, it's still very stern heavy but the back platform is now clear of the water with the front nicely afloat. I still think it's a bit low, the waterline should be the tops of the wheel arches if possible. Fitted with all the gubbins you saw yesterday, the model has a weight of 261g. I think what this proves is that the scale option isn't an option. I need more buoyancy and this has to come from somewhere. Favorites at present are a sealed section under the middle of the van and a large extension of that below the rear platform. It could be that what I've done is prove why the prototype sank, and why the second version had more hull. Mind you, that sank too albeit in rough seas. 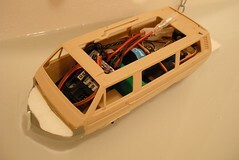 Fitted with the 9V battery plus the receiver and speed control, the Damper van doesn't sink ! But only just. The water is at the very top of the rear platform. If I add a figure then he'll get wet feet. At the front end things are a bit better but the waterline is still far too high. I want to sail this thing on open water, not just the bathroom sink. That means a radical rethink methinks. My trip to Stafford this year was a mission to talk to the traders - and not with credit card in hand either ! No, the plan was to get some feedback from last months Leamington show, see how it went from their point of view and where we can improve things. I know this sort of thing can be done by e-mail but the personal touch is much better and will garner much more candid opinions and gossip. As it happens, they all seem to be happy with what we are doing. Eshewing a morning arrival for an early lunch in the Wetherspoons pub in the town centre, beautifully converted from an old cinema, I arrived off the vintage bus just after 1pm. There's no point in being there earlier if you want a chat as they are too busy serving eager customers to stop. To be honest Sunday afternoon is the ideal time for this job but that would have meant a drive up the M6 rather than a train ride and who wants that ? The hall was busier than I think I've ever seen it - walking around was pretty difficult at times. However perseverance paid off and I saw everyone I needed to. I even clocked a few layouts although certainly not all of them - too much gasbagging for that ! Those I did see looked good - I like Stafford clubs coal mine. These aren't the easiest subject to model what with being huge and this only showed part of the site. What was there though was really well modelled. Bridport Town looked nicer than the photos in the recent Narrow Gauge & Industrial Magazine. Perhaps this was down to a bit more stock being on display or just I could appreciate the very 3D nature of some of the building layout better in the flash. The builder has obviously put a lot of time to getting that seemingly random arrangement of structures and it pays off. Apart from that, and the tea urn going cold when I reached the front of the queue, it was good fun. I could have spent a few hours more and found plenty to occupy myself. As far as purchases went, I bought an old book on building buildings and a snail, of which more later, so a cheap trip thanks to me chanting "I need no more projects. I need no more projects." as I walked round. In the meantime, there are some photos on Flickr. The front cover of "Model Railway Journal", the magazine for the finescale model railway fraternity, shows some buildings by George Iliffe Stokes. Looking at them I was struck by the similarity with those seen on the Madder Valley Railway built by John Ahern. Both layouts are home to buildings with bags of character. 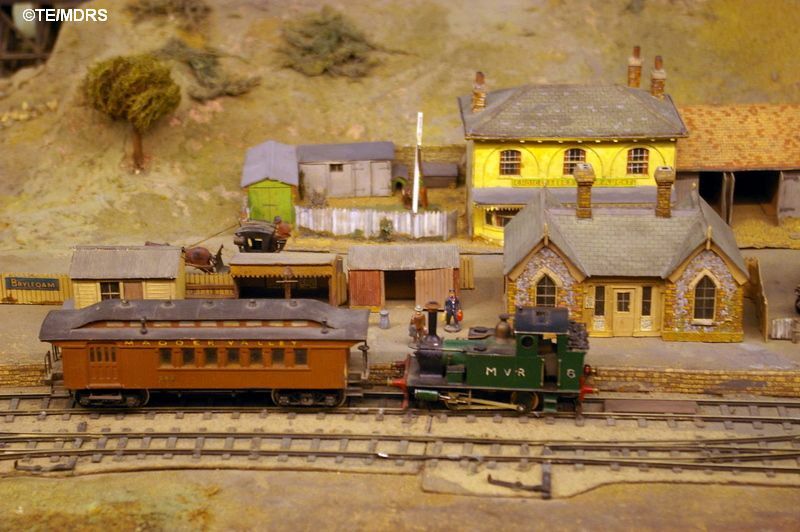 All are scratchbuilt using the materials available to modellers before the middle of the 20th Century and both are deservedly famous as they were created in an age when railway modellers didn't really bother with anything beyond the lineside fence. These men were artists who attempted to produce a complete scene rather than just see the trains whizzing by. Yet there is one thing that makes me smile more than any other - if either layout were produced today, no magazine would be interested in featuring it. That's especially true for MRJ where only the highest standards are to be seen. The editors would probably say nice and encouraging things, praise the effort required to make everything from basic materials and then return the photos. You can see why too. A trip to any decent model shop with your credit card will see you leave with ready built structures of a standard Stokes and Ahern could only dream of. Should you not want to bother leaving the house, Scalescenes will let you download kits to be printed off at your leisure. What really stands out is that the old models look old. They don't have the level of detail we now expect, yet aside from the glues used, we can make models from the same materials today and they will look squarer and generally sharper. I wouldn't call myself the best building modeller in the world yet I bet I could knock up something of a higher standard. Why ? Two weeks ago we had the AGM for the model boat club. After the official business there was a talk from a trustee looking after King Henry the 8th's famous ship, the Mary Rose. One of the problems they have is that no one really knows what the vessel looked like when it sank. There are drawings but generally they are terrible. It seems that artists of the day didn't understand the concept of perspective. Therefore the images are hopeless, misshapen with guns pointing in all directions. Why ? It's not like the artists couldn't have done the same thing we are all taught - "Draw what you see" - perspective isn't even that difficult a concept to grasp but we are still stuck with paintings that are hopelessly unrealistic. It's the same thing with model making. We each stand on the shoulders of those who went before. Stokes, Ahern and a few others created modeling as we know it. Were I to start from the position they were in, without any reference and having to develop every technique myself, I'd be rubbish. And for that we owe them a great deal. The Damper van sailed OK last time but only if ignored the gentle sinking going on. 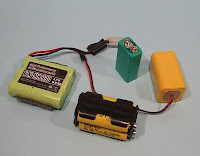 My feeling is that the battery pack at the front was too heavy. At the very least it was too large so I need options. So it looks like 9 volts of rechargeable battery it is then. Best of all, the lump is physically smaller than the AA set in it's holder so I can move it back a bit in the boat. Let/s hope this works. 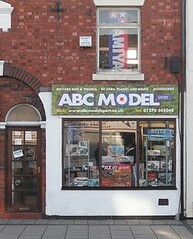 5 minutes walk away from Crewe station (go out the front, turn left and keep walking) finds ABC Model Sport. Primarily a military modellers shops, they do cover other areas of the hobby. The shop isn't large but what space there is is well filled with stock. I was particularly taken with a new range of cast naval figures but it appears that so are lots of others as the ones I wanted were out of stock ! Even if your interests aren't tank related there is still lots to make it worth a visit as the range of materials and paint is good and we all need these. Once in you'll probably find more wallet lighting goodies too. Useful grass tufts for scenic work ? Some pin-up girls perhaps ? One word of warning - if you do decide to pay a visit while waiting for a train connection, check you know where the platforms are. I didn't and missed mine thanks to spending longer than expected in the shop ! Fitting the feet to my toolbox should have been easy enough - I've used the same things many times on model boat boxes - but for some reason the screw heads pulled through the rubber. After a bit of thinking I rooted around in the garage and found one of those cheap plastic boxes of assorted washers. The smallest size just fitted onto the hole with a bit of shoving and then when screwed home, clamped the foot tight against the wood. This is the model people want. Never mind all the niggles about minor detail points on the NRM/Bachmann "City of Truro", what everyone wants is one with a face on it ! Technically, it's completely prototypical too, as Truro did visit Sodor and became friends with Duck (GWR engines stick together like hoddies around the doorway of an off-licence) so there can be no complaints about accuracy. Want more Sodor facts, try here. With carefully washed hands I opened the big box from the National Railway Museum (actually from a distribution centre about 8 miles from where I live) to expose lots of big plastic air bubbles. Under these was some foam and in the foam a locomotive box encased in bubble wrap. On the bench, the model looks superb. In real life the orange lining is a lot less glaring than it appears in the magazine photos I've seen. Everything else looks lovely. If this was in BR Mixed Traffic livery, even I'd want one. Steve was happy for me to put the model on a rolling road - it's a lot easier to get anything fixed from the UK than it is on the other side of the planet - so I propped up the tender and bogie as best I could and set the engine in motion. The results can be seen in this video. Control was via a 1960's H&M Clipper. Even out of the box it is excellent. Some gentle running in and a better controller and this will be horribly silky smooth. I've got all the bits for motorising the Airfix kit and I doubt I could could produce a result as good as this.